Pistachios are prized for their unique, slightly sweet flavor as well as for their intriguing viridescent hues. Pistachios are one of the world’s oldest nuts, being grown in the Middle East for thousands of years. They are even mentioned in the Old Testament of the Bible, which indicates their rich history as a prized food source (American Pistachios, 2014). Like all nuts, pistachios are rich in beneficial nutrients. However, pistachios have some unique properties that set them apart. 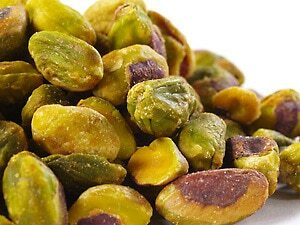 Their versatility means that you can eat pistachios alone as a snack, on top of a salad, mixed with dried fruits in trail mix, in baked goods, or as a crunchy coating for fish or meat. In addition to these distinctive traits, consider the following nutritional benefits of pistachios as an added perk to their particularly pleasant palate. 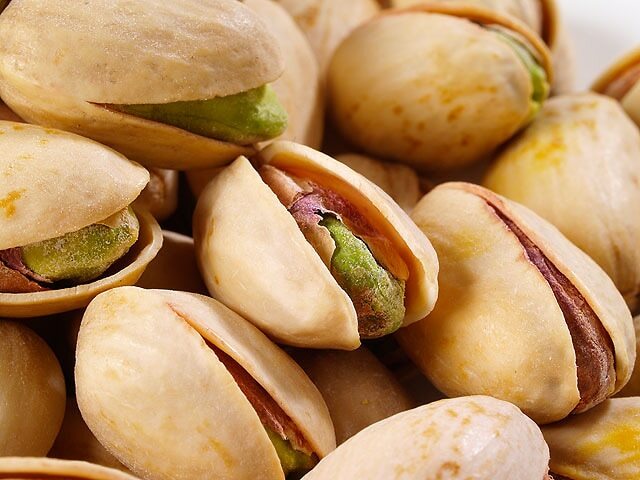 Most nuts contain large amounts of protein relative to their size, and pistachios are no exception. A 1-ounce serving of these nuts (approximately 49 pistachio kernels) contains 6 grams of protein (Self Nutrition Data, n.d.). Your body breaks this protein down into its constituent amino acids, which can be used to repair tissues or to create new molecules. Plus, eating protein-rich foods helps you feel satiated, reducing your cravings for unhealthy foods later on. This makes pistachios the perfect mid-afternoon snack. Pistachios are a high-fat food, but that is not a bad thing. Per serving, pistachios contain 13 total grams of fat (Self Nutrition Data, n.d.). However, only 2 grams of fat are saturated fats, the unhealthy fats that are associated with higher risk of cardiovascular disease (American Heart Association, 2016). The rest of the fats are polyunsaturated and monounsaturated fats, which actually protect the heart. This includes omega-3 fatty acids, a type of fat that has been associated with lower levels of “bad” cholesterol and higher levels of “good” cholesterol (Penn State News, 2010). Pistachios contain alpha-linoleic acid (ALA), a beneficial type of omega-3 fatty acid that can also be converted to DHA and EPA, the two other forms of omega-3s that are only found in animal sources. Thus, vegetarians and vegans may eat pistachios as a source of the omega-3 fatty acids their bodies need. As our cells grow older, they accumulate oxidative damage. This can be related to the presence of free radicals, which can cause considerable damage to cells. A class of molecules called antioxidants can sweep up these free radicals and reverse some of the cellular damage. Pistachios are an excellent source of antioxidants, including lutein, beta-carotene, and gamma-tocopherol (Penn State News, 2010). Beta-carotene serves as a precursor to vitamin A, while gamma-tocopherol is used as a precursor to vitamin E. Both vitamin A and vitamin E themselves have very high antioxidant activity, making pistachios a great way to reap some of the oxidative damage-fighting effects of these vitamins. In a randomized study of the effects of pistachios, researchers found that incorporating these nuts into the diet was associated with lower levels of harmful LDL cholesterol (Penn State News, 2010), possibly because of the antioxidants present in pistachios. Phosphorus is an element that is essential for our proper physiological functioning. Not only does phosphorus make a structural component of all cells, but it also regulates a variety of physiological reactions (Calvo, 2014). Getting enough phosphorus ensures that your cells can continue to produce energy and also strengthens the bones. A 1-ounce serving of pistachios contains 137 mg of phosphorus, 14% of the Daily Value (DV) for the nutrient (Self Nutrition Data, n.d.). Vitamin B6 has myriad health benefits. Failure to get enough vitamin B6 has been associated with elevated risk of cardiovascular disease, certain types of cancer, and cognitive dysfunction (Office of Dietary Supplements, 2015). Thus, getting vitamin B6 through your diet may improve your cardiovascular health and keep your brain sharp. Women need 1.5 mg of vitamin B6 per day, while men need 2 mg per day. A 1-ounce serving of pistachios contains 0.4 mg of vitamin B6, helping you reach your daily recommended intake of this beneficial vitamin. The following recipes utilize these fatty nuts for their full flavor and nutritive value. Try these simple dishes with your next purchase of the palatable pieces and grab a bag today! A superb way to start your day, this hot cereal blends an assortment of healthsome ingredients to kickstart your morning with the potent nutritive value of moringa powder, oats, and pistachios. These delectable bars offer a soft snack that you’ll savor as your new preferred midday collation. The bars are easy to make and offer enduring energy and a satiating blend of protein and fiber. Another energy bar on the sweeter side of things, these goji berry bars pack the added benefits of the antioxidants contained in the superfood goji berries. These bars are perfect for an energizing snack when your sweet tooth beckons. Green tea offers myriad benefits that can be enjoyed in many forms, and muffins are no exception. These exceptional confections are served with a topping of chocolate and chopped pistachios that is simply superb! Perhaps you’re searching for a sweet where the palate of pistachio is the star of the show with its rich flavor shining above other tastes. These sandwich cookies are then the perfect treat, pairing their rich flavor with the naturally sweet coconut filling. Another cookie that emphasizes the unique flavor of pistachio, these cookies pair the nut with the tart taste of cranberries. The result is a mouthwatering confection that is sure to satisfy your sweet tooth. We offer an abundance of pistachios and pistachio snacks that you’re sure to love. You can find a full list of our pistachio products here, but you can also find a small sample of our favorite pistachio products below. Searching for a supply of energy to get you through the workday or to power you through an enduring workout? These squares include a blend of wholesome ingredients selected to provide the perfect boost. A unique treat that takes an innovative twist on a classic treat, these turkish delights offer a distinctive blend of chocolate and pistachio that will tickle your taste buds and satisfy your sweet tooth. Searching for a way to create gourmet desserts that feature the superb savor of pistachios with a light and fluffy feel? This paste is the perfect way to adorn your desserts with a palatable garnish or to fill them with the pleasant relish of pistachios. These roasted pistachios offer the classic taste of the kernels without the hassle of wrestling with the often impenetrable external hulls that encase them. Fill a small bowl with these delectable nuts and enjoy a savory snack between meals. Not typically a fan of nuts? Trying to opt for a healthier alternative to heavily seasoned chips and snack foods? Start eating smart with these sweet and spicy chipotle pistachios for a full rich flavor that encourages healthier eating habits. Do our aforementioned recipes for pistachio cookies entice you? Create any manner of plates with a pistachio palate using this pristine pistachio flour. The powder is perfect for producing pistachio macarons and countless other confections. Have your cake and eat it too with this delicious Pistachio Cake Recipe! Our Registered Dietitian and Health Nut, Molly Morgan, has created an easy and tasty recipe that won't kill you with calories!